Have you ever wondered what other states/provinces do at their conferences? This October you can stop wondering! For not much more than the price to attend CASE, you can come to Atlanta just a couple of days early and attend GA CASE's fall conference! CASE members' price to register for both GCASE and CASE is only $575 (if you are from GA, it is only $500)! A nonmember can attend both for just $675. The GCASE conference begins on Wednesday morning, the theme is Taking Care of Business and ends just as the CASE conference, Continuing to Take Care of Business begins with a luncheon on Thursday! The GCASE keynotes will be Dr. Timothy Rasinski and Mr. Brian Oglesbee. There will be wonderful breakout sessions that will be applicable to all special education administrators! What an amazing opportunity to see what another state is doing on the same issues you are facing! And to have a couple of extra days in downtown Atlanta is another treat! The Atlanta Hyatt Regency is right on the MARTA (Atlanta's rapid transit system) — you don't even have to go outside to catch the train — which also goes to the airport! This a an opportunity that doesn't come along very often and will be a huge benefit to both your district/institution and to your unit as you get ideas to bring back to both! So, if you have ever wondered what other units do, here is a great chance to see firsthand what GCASE is doing — by the way, GCASE was the recipient of the CASE Exemplary Unit award in April and is the largest of the 41 CASE units ... so this is a great opportunity to see why on both counts! See you in Atlanta! Speaking of wondering... Do you spend time wondering what is NDD? Most of you have seen those initials, even in this article. NDD stands for Non-Defense Discretionary spending ... education falls in this category and this category along with Defense spending are impacted by the Sequestration rule. As Congress scrambles this fall to try to pass the necessary budget bills to keep the government from shutting down, Sequestration will be a big issue. By the way, even the most optimistic odds I have seen on the government not shutting down is less than 50 percent! Both sides of the aisle are tying the CR (Continuing Resolution) to hot political issues so no one seems to think it is going to work! But ... it is VERY important for you to know how Sequestration is impacting and WILL impact your school district, your students, faculty, and community! To learn more about Sequestration, go to NDDUnited. A press conference was held on September 10, 2015 with Representatives Van Hollen, Delaruro, Lee and representatives from the 2500 different organizations who signed on to a letter asking to raise the cap. CASE and many of the state units signed on to the letter. Thank you to all of our units that did sign on to the letter! Follow-up this #RasietheCap day with your own tweets, blogs, etc. This is a bipartisan issue that if not fixed will continue to hurt children, families, schools, communities and definitely our country! I have already encouraged you to attend both the GCASE and CASE Annual Conference... But I want to give you one more opportunity! Just think about all the amazing networking you can do with folks from over 35 different states and 3 countries! Registration for the 26th Annual CASE fall conference is definitely a bargain at member price of only $400 considering the price includes all the handouts, lunches on Thursday and Friday, full breakfasts on Friday and Saturday, and Break on Thursday and Friday, and great free resources from vendors, CASE, and networking with your colleagues! We have over 40 breakout sessions, the schedule is still tentative. Be sure to register soon, and to get your hotel room at the Atlanta Hyatt Regency be sure to use the access code: case! Or go to the CASE home page! 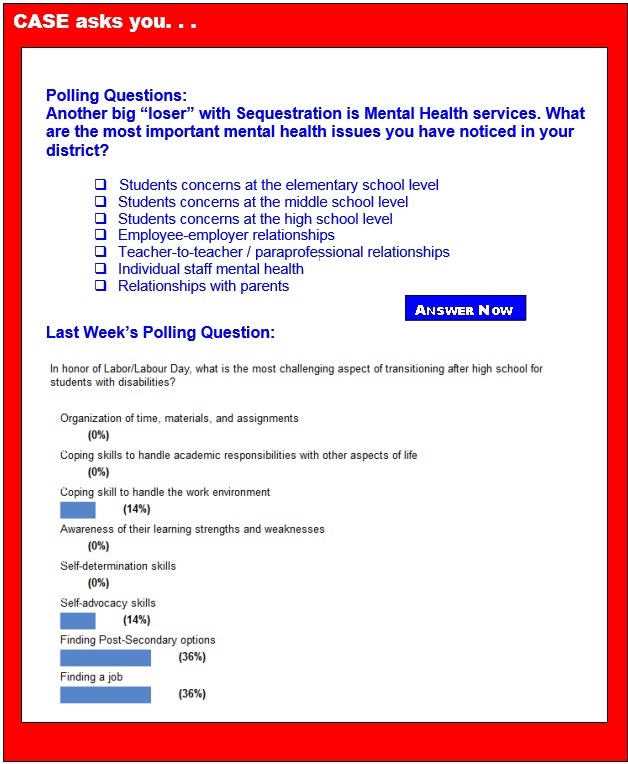 Last week, the Poll asked, In honor of Labor/Labour Day, what is the most challenging aspect of transitioning after high school for students with disabilities? There was a tie for the answer that got the most votes at 36 percent each, and really isn't very surprising: Finding Post Secondary Options and Finding a job! There was also a tie for the next place at 14 percent: Coping skills to handle the work environment and self-advocacy skills. We all know we must continue to work smarter and more efficiently on making sure our young people can find and are prepared once the do find both post-secondary options and/or jobs! Thanks for all you do every day to help make that vision a reality! The topic of restorative practices is receiving a lot of attention as an alternative to disciplinary measures. These practices keep students in school and introduce them to an educational restorative process that is "not interested in blame, shame, fault, apologies or excuses ... only fixing." With origins in the juvenile justice system, the goals of restorative practices are to heal both the victims and the student offenders, to hold the offenders responsible for their behavior, and to strengthen the school community in order to prevent further harm. Although research studies on restorative practices have been limited in scale, they cover a variety of specific practices in a wide range of settings and, overall, they produce positive results. Therefore, restorative practices offer a promising alternative approach to exclusionary discipline practices. Join the Federal Partners on Women and Trauma to catalyze a trauma-informed national strategy. This event is available via webcast or live event at the U.S. Department of Labor. The United States is experiencing a public health crisis: an epidemic of trauma, violence and toxic stress. In response, efforts to create trauma-informed change are growing exponentially across the nation. Learn how communities are responding and develop your own strategy to amplify change through four "Catalyst Sessions": Communities, Health Care, the Justice System, and Education. Presentations will highlight effective collaborations, promising practices and programs at the state and local levels, as well as first-person experiences, including workforce systems and worker issues. Information on how to register to attend the live event at DOL, via an amplifier site, or individually via webcast can be found at: https://www.blsmeetings.net/traumainformednation/. Are your struggling readers prepared for college and career? Professional Development Workshops Near You! Back by Popular Demand, Lindamood-Bell® Workshops in Canada! Join us for highly interactive Lindamood-Bell Workshops, where our experienced presenters will instruct you in the steps of our programs. Learn to develop reading, spelling, and comprehension. We believe, passionately, that all children and adults can learn to their potential. "We know that right now during the first three years of life, a child born into a low-income family hears 30 million fewer words than a child born into a well-off family. By giving more of our kids access to high-quality pre-school and other early learning programs, and by helping parents get the tools they need to help their kids succeed, we can give those kids a better shot at the career they are capable of, and a life that will make us all better off." During the first few years of life, children's brains develop at a rapid pace, influenced by the experiences they have at home, in their early care and education settings, and in their communities. Their experiences include the quantity and quality of words they are exposed to through talking, reading and singing. Research has found that providing infants, toddlers and preschoolers with rich early language experiences can have important benefits on their brain development and school readiness. Today, the U.S. Departments of Health and Human Services and Education, in partnership with Too Small to Fail, are releasing "Talk, Read, Sing Together, Every Day!," a suite of resources that can help enrich children's early language experiences beginning from birth. This toolkit is the result of a commitment made at the 2014 White House convening focused on bridging the "word gap." The suite of resources includes tip sheets for families, preschool teachers, and infant/toddler teachers and caregivers, as well as a fact sheet that highlights the evidence behind the benefits of being bilingual and embracing children's home languages. All tip sheets are available in English and Spanish, and can be downloaded for free at toosmall.org. We hope you find these resources helpful and share them with your networks! The Conference on Behavior Issues for School Leaders sponsored by Midwest Symposium for Leadership in Behavior Disorders provides evidence-based information for building leadership teams to build positive student behavior and work effectively with difficult students. Conference features: Vern Jones, Ph.D., author and co-author of books including, "Comprehensive Classroom Management: Creating Communities of Support and Solving Problems", and "Creating Effective Programs for Students with Emotional and Behavior Disorders." Sessions will focus on what school leadership teams can do to support teachers in their work with challenging students. David Bateman, Ph.D., co-author of "A Principal's Guide to Special Education" and "The Special Education Program Administrator's Handbook" will talk about what special education teachers want/need from their school leaders and what administrators need to know about the 504 process. The screening for The Raising of America early childhood documentary was a great success! We had a strong turnout for the event with over 100 participants, including many online. Our panelists, Libby Doggett, Linda Smith and Christy Kavulic, led a lively discussion about the state of early childhood education in America and how the Administration is working to address the most critical issues faced by families with young children. Thank you to all who joined us to view The Raising of America documentary. If you missed the screening, you can view it on EDSTREAM until July 31. How safe is the schoolhouse? The following Notice of List of Correspondence From April 1, 2014 Through June 30, 2014 and July 1, 2014 Through September 30, 2014 was published in the Federal Register on Monday, July 20, 2015. Summary: The Secretary is publishing the following list of correspondence from the U.S. Department of Education (Department) to individuals during the second and third quarters of 2014. The correspondence describes the Department's interpretations of the Individuals with Disabilities Education Act (IDEA) or the regulations that implement the IDEA. This list and the letters or other documents described in this list, with personally identifiable information redacted, as appropriate, can be found at: www2.ed.gov/policy/speced/guid/idea/index.html. The following Notice of Comment Request: Office of Career, Technical, and Adult Education; Rehabilitation Services Administration; Information Collection for the WIOA Performance Management, Information, and Reporting System (OMB Control No. 1205-0NEW), New Collection was published in the Federal Register on Wednesday, July 22, 2015. Summary: The U.S. Departments of Labor and Education (the departments), as part of their continuing effort to reduce paperwork and respondent burden, are conducting a preclearance consultation to provide the public and Federal agencies with an opportunity to comment on the proposed collection of information in accordance with the Paperwork Reduction Act of 1995 [44 U.S.C. 3506(c)(2)(A)] (PRA). The PRA helps ensure that respondents can provide requested data in the desired format with minimal reporting burden (time and financial resources), collection instruments are clearly understood and the impact of collection requirements on respondents can be properly assessed. Currently, the Departments are soliciting comments concerning the collection of data for the WIOA Performance Management, Information and Reporting System (OMB Control No. 1205-0NEW). The data collections included in this reporting system fulfill requirements in WIOA Sec.116(d)(1) for the development of report templates for the State Performance Report for WIOA core programs, the Local Area Performance Report, and the Eligible Training Provider Report. Previously, a supporting statement was provided for this data collection under OMB Control No. 1205-0420, which was made public on April 16, 2015. The sole difference between the aforementioned supporting statement and the subject of this notice is that OMB Control No. 1205-0NEW does not include the non-WIOA related, currently cleared burden. Dates: Click here to submit written comments to the office listed in addresses the on or before Sept. 21. The following Notice of Applications for New Awards; American Indian Vocational Rehabilitation Services — Training and Technical Assistance was published in the Federal Register on Wednesday, July 22, 2015. Notice inviting applications for new awards for fiscal year (FY) 2015. Catalog of Federal Domestic Assistance (CFDA) Number: 84.250Z. Applications Available: July 22, 2015. Date of Pre-Application Webinar: July 30, 2015. 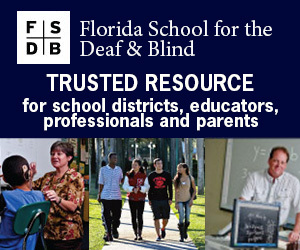 The following Notice of Applications for New Awards; Independent Living Services for Older Individuals Who Are Blind--Independent Living Services for Older Individuals Who Are Blind Training and Technical Assistance Program was published in the Federal Register on Wednesday, July 22, 2015. Notice inviting applications for new awards for fiscal year (FY) 2015. Catalog of Federal Domestic Assistance (CFDA) Number: 84.177Z. Deadline for Transmittal of Applications: Aug. 21. The following Notice of Applications for New Awards; Rehabilitation Services Administration, Disability Innovation Fund--Automated Personalization Computing Project was published in the Federal Register on Thursday, July 23, 2015. Notice inviting applications for new awards for fiscal year (FY) 2015. Catalog of Federal Domestic Assistance (CFDA) Number: 84.421A. Dates: Applications Available: July 23, 2015. Date of Pre-Application Webinar: Aug. 5, 2015. Deadline for Transmittal of Applications: Sept. 8.